Cap Connection is the premier automotive accessory store in Waukesha, Wisconsin, servicing customers from all over the area. Our wide selection of durable products and accessories are available for installation on any truck or car, through our on-site service center. The experienced technicians at Cap are seasoned vets in the vehicle installation industry: we’ve been around for over 3 decades, providing superior trailer hitch installation services to customers from here to Madison, to Oshkosh and back—we know our stuff. Trust Cap Connection when you need trailer hitch installation services in Waukesha. Our quality service is only as good as the products we provide: that’s why our in-store accessory showroom showcases trailer hitches from the top manufacturing companies in the industry. Are you an independent contractor? Do you spend your weekends up north? If you’re a truck driver and you’re always hauling trailers around on your own, the Swift Hitch Camera System is a life changer. This wireless camera can be attached to almost any surface and makes it easy to back your truck up to align two hitches perfectly without needing a helping hand. At Cap Connection, we’ve anticipated trucks aren’t your only passion. If you love open water as much as you love the open road, DrawTite Trailer Hitches are a simple solution for you to bring both worlds together! Take your boat out to the lake this year with the help of these reliable trailer hitches – stop by our Waukesha shop to have it installed! This part of the selection is where it gets fun. You drive a truck, but now you get to decide what you tow behind it. 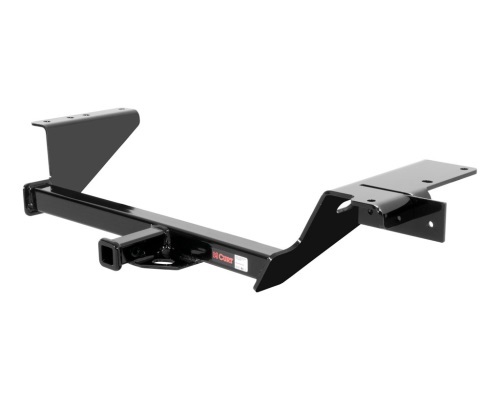 From the front mount trailer hitch to the multi-fit trailer hitch and bumper mount trailer hitch, our products from CURT give you a wide range of options to choose from. Contact us today and we’ll help you find the best one for your needs! Quickly and easily change out the towing balls and get towing faster. The Interchangeable Balls are available in 1-7/8”, 2” and 2-5/16”. The Convert-A-Ball Cushioned Ball Mounts are designed to reduce bouncing and vibrations. These are available in 2”, 4”, 6”, 8”, 10” and 12” drops, and can be reversed and used as a riser. Razor Aluminum Adjustable Hitches model XTR are available from Cap Connection. These hitches feature a free keyed alike receiver lock to prevent theft. The Razor Adjustable Hitches can be adjusted up or down in 1” increments. Razor fixed mount aluminum hitches are reversible – they can be flipped and used as a riser. These are available in 2”, 4”, 6”, 8” and 10” sizes. Cap Connection also carries Trimax locking receiver pins and universal coupler locks--check out our showroom or contact us for more details. Contact trailer hitch experts at Cap Connection for more information on our accessories and truck services.